Have you ever wondered about the difference between a deep tissue and a Swedish massage? Well now you can find out. The Spa at Hotel Galvez, A Wyndham Grand® Hotel, is introducing a new Health and Beauty Series to educate clients on popular health and beauty topics. Led by expert speakers and in-house staff, these educational sessions will begin in March and are scheduled at 6 p.m. at The Spa at Hotel Galvez, located at 2024 Seawall Blvd. Master your makeup! Watch several live makeup demonstrations that start with a color match test and end with finished faces. This class explores changing your look from day to night and offers tips on addressing your unique facial attributes as well as how to conceal the most common skin care issues. Spring time renewal! Have you ever wondered which products and ingredients to look for when addressing skin care needs to leave your skin, hair and nails in tip-top shape? Our talented stylists and estheticians will discuss everything from hair loss to protecting your skin and hair from seasonal changes in temperature and humidity. Health is wealth! A strong immune system is what helps you fight, combat, prevent or reverse lifestyle diseases related to diet. Learn easy ways to minimize toxins in your life, what chemicals to look out for in cleaning products, organic vs. natural foods and much more. The power of touch. Massage and body work continue to gain in popularity as people realize their significant health benefits such as lowering blood pressure and relieving pain. Learn about proper draping techniques, basic massage techniques and what to expect from body work. Fit for life! This seminar will focus on questions and answers from fitness professionals on everything from exercise progression to the best nutrition before and after a workout. Don’t miss this opportunity to learn more about fitness in a fun and open forum. The Spa at Hotel Galvez is a nearly 10,000 square-foot facility with nine treatment rooms, accompanying Kérastase level salon and fitness center. The spa offers a Relaxation Room, Meditation Garden, Hydrotherapy Room, Vichy Shower, Steam Room and Couple’s Massage Room. 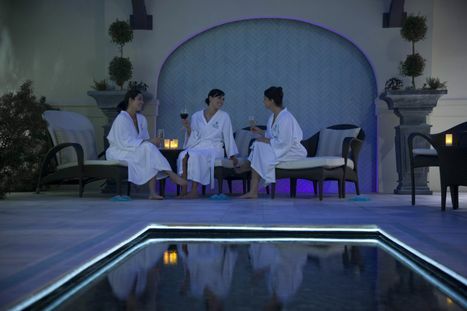 The Spa is open Wednesdays through Saturdays from 9 a.m. to 7 p.m., Sundays through Tuesdays from 9 a.m. to 5 p.m., and closed on Mondays until March. Hotel Galvez, A Wyndham Grand Hotel, is managed by Wyndham Hotel Management Inc., and owned by Galveston preservationist George Mitchell as part of Mitchell Historic Properties. For reservations, call (409) 515-2100 or visit www.HotelGalvezSpa.com. The Spa at Hotel Galvez is the only hotel to offer a four hand massage with two massage therapists working simultaneously. The Spa’s Meditation Garden can be used between treatments or for small parties.